Are you confused by all the poker terms that are used? Are you fed up of staring blankly at the screen when people use poker terms in the chat box whilst you are playing online poker? 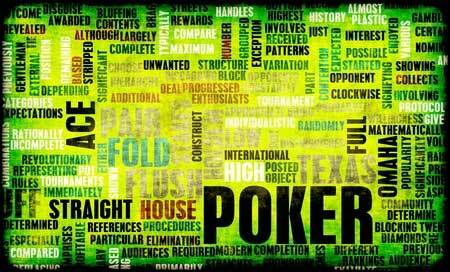 Well here’s our beginners guide to poker terminology. Not only will you be able to play like a pro with what you learn at the Poker Professor University, but you will also be able to talk like a pro as well! Add-on – in a tournament you may have the opportunity to add to your chips by buying extra chips after the first period of play. All-In – to place all your remaining chips into the pot. Ante – bet made before the cards are dealt on each hand. Bad Beat – a hand where you lose to a player against the expected odds. Bicycle – nickname for a low straight (A-2-3-4-5). Big Slick – the nickname for when you are dealt Ace-King. Blind(s) – compulsory bets places before the cards are dealt by the two players sitting to the left of the dealer. Bluff – to attempt to steal the pot by representing a hand stronger than the one actually held. Board – the community cards showing on the table. Boat – nickname for a full house. Burn – to discard; the dealer ‘burns’ the top card before dealing the flop, turn and river. Button – the dealer button which denotes the position of the player in the seat of the dealer. Buy-In – exchange of cash for chips to sit at a table. Call – to match the highest bet made to date. Cash In – to leave the table and exchange your chips for cash. Check-Raise – a play where you check at first and then once an opponent bets, to raise him. Community Cards – the flop, turn and river cards dealt face up in the middle of the table. Cowboys – nickname for when you are dealt two kings (pocket kings). Fifth Street – the fifth and final community card (also known as the river). Final Table – the last table in a tournament when all other players have been eliminated. Fish – a player who stays in pots hoping to catch the right cards to create a winning hand – but against the odds. Flush -five cards of the same suit. Flush Draw – when you have 4 cards of the same suit and you are hoping that the subsequent card(s) will produce a fifth card to complete the Flush. Fold – to throw away, or muck your cards. Fourth Street – the fourth community card (also known as the turn). Heads Up – 1 v 1 play at a table containing only two players. High Roller – a player who competes for very high stakes. Hole Cards – the name for the two cards dealt face down to each player and which only the player can see. Kicker – card(s) not involved in the formation of a poker combination, but still part of the five-card poker hand. Lay Down – to concede or give in your hand. Limp In – to call the size of the blind without raising it. Loose – a loose player is likely to play allot of hands and make allot of speculative plays. Muck – to fold or discard your hand and not show your cards to your opponents. Nuts – the best possible hand. Outs – cards which will improve your hand to a winning status. Overcard – higher cards than those showing in the community cards, or higher cards in the community cards than those in your hand. Position – a player location at the table measured relative to the position of the dealer button. Pot – the collection of chips which will be awarded to the winner of the hand. Raise – increase the size of the biggest bet at the table. Re-buy – in a tournament, when you lose all your chips early on, you may be offered the opportunity to pay the entry fee again for another set of starting chips. Re-Raise – when you make a raise when a player has already raised once. River – the fifth and final community card. Rock – the term for a player who chooses to play with only the best hands and bets only when he is sure that he is best. Rush – a roll or sequence of successful plays. Satellite – a qualifying event for a big poker tournament. Second Pair – a pair formed by the second highest card on the board. Set – 3 of a Kind or ‘Trips’. Short Stack – when you have less than the average amount of chips. Short Handed – a poker table containing fewer players than normal. Showdown – when a bet is called after the river card and all players must show their hand to decide who wins the pot. Side Pot – a secondary pot, formed because one player is all-in and cannot bet any more into the pot contested by the remaining players. Slow-Play – to give the impression of weakness or uncertainty by checking or calling bets rather than raising them. Straight – five cards in sequence (5-6-7-8-9). Suited – cards are the same suit. Tell – an indication, often subconscious or unrecognized by the player himself, by which the other players may gain an insight into the strength of a player’s hand. Tilt – usually a sign of frustration or anger, a player may go ‘on tilt’ by playing too many hands of poor quality and subsequently giving his chips away. Top Pair – a pair formed by the highest card on the board. Turn – the fourth community card. Whale – a gambler or poker player of enormous wealth for whom big losses are not important. Well that’s just a start and I’m sure there are plenty of poker terms that have been missed. Why don’t you add any others that you know in the comments below.